The Short Version: It can be tough to re-enter the modern dating scene as a senior single, but a friendly seniors-only dating site can make the experience more enjoyable from start to finish. Available in the US and the UK, PremiumMatureDating.com provides singles over 50 with a secure and responsive platform to meet new people. It’s completely free to join, browse for date prospects, and send one message to any members who interest you. The user-friendly interface serves mature men and women with everything they need to build strong connections online. As a full member, you can start a correspondence with a genuine person and gain confidence in the online dating process. Whether you’re seeking a pen pal or a lifelong love, Premium Mature Dating can introduce you to many compatible matches in your area. After her husband of 20 years left her, Stella launched into the modern dating scene by creating profiles on 14 dating websites. She hoped her love life would take off immediately, but it took time for her to get comfortable with the new way of meeting people and arranging dates. She had been actively dating online for over two years when she met a 52-year-old engineering project manager named Edward and fell in love. Premium Mature Dating has established an international dating network for singles over 50. Seniors may find online dating intimidating at first, but a friendly and accessible singles network can be life-changing for daters, like Stella, who need some help getting back out there. PremiumMatureDating.com offers singles over the age of 50 a welcoming place to start again. Over the years, the seniors-only dating site has cultivated a growing community of thousands of men and women in the US, UK, Australia, Canada, Ireland, New Zealand, and South Africa. Designed with seniors in mind, the platform provides a low-pressure environment where you can chat people up and see where things go. You can join Premium Mature Dating in five simple steps. Just select “Man seeking woman” or “Woman seeking man,” input your date of birth, your first name, your email address, and create a password. That’s it! Within moments, you’ll get an email prompting you to verify your email address and complete your profile. After that, you can upload a photo or two, edit your profile, and browse the dating network for potential matches. The profile questions are simple, but, if you’re stumped for ideas about “what you like to do for fun,” for instance, the site provides helpful sample answers on the sidebar to show beginners how to successfully attract attention online. 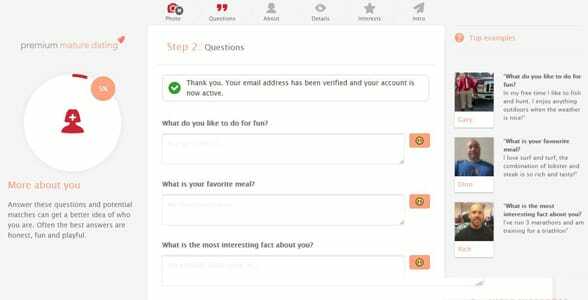 Remember, the profile questions are all optional, so feel free to hit “Skip this step” if you don’t want to reveal certain personal details such as your height, income, interests, religion, etc. 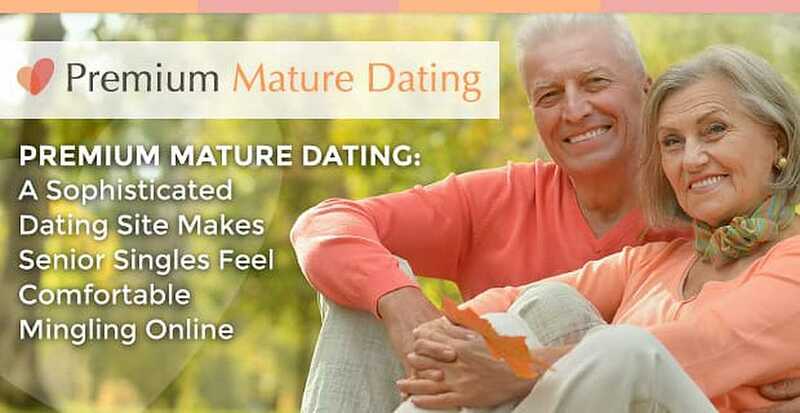 Premium Mature Dating fosters a quick and easy signup process to help seniors get started. The members on Premium Mature Dating range in age from 50 to 75. These men and women have come to the dating site because they’re interested in connecting with someone special and don’t want to waste time with immature daters. Whether you’re looking for a long-term partner or a new friend, you can use this secure and niche dating network to meet seniors in your area and abroad. You can think of Premium Mature Dating as a dating practice ground where you can gain experience flirting with people your own age. A majority of users on Premium Mature Dating are new to online dating and therefore need a little extra guidance. The site’s moderators are sensitive to the security concerns and technical inexperience of the senior population. Annie told us the team makes efforts to protect their members by encrypting private details and providing information about potential scams. Before you start online dating in earnest, you might want to look at Premium Mature Dating’s safety tips, which include useful guidelines for meeting people online and in person. Premium Mature Dating uses sophisticated matching tools to bring seniors together online. You’ll receive email notifications the moment someone shows interest in you (by sending a message or a wink, for instance), and you can also use advanced search features to find someone who meets your dating criteria. Basic members can send one free message to any member they like, so you can get a feel for the site and start a flirtatious conversation before upgrading to full membership. You can sign up for a one-year membership for as little as $10.50 per month. Full members can read and reply to messages as well as see who’s viewed their profiles, so it’s ideal for online daters who feel ready to engage with people and find dates on Premium Mature Dating. When you’re single and of a certain age, you might think your dating days are over, but, on Premium Mature Dating, you’ll find they’re actually just beginning. The safe, simple, and congenial dating site welcomes seniors who are looking for friendship and love. You don’t have to be a technical genius to create a profile and meet people on this site — just fill out a profile, search for members, and send a message to anyone who catches your eye. It’s free to wink or send an initial message, so you can try Premium Mature Dating and become comfortable with the site’s interface before upgrading your account. Premium Mature Dating’s safe online environment is ideal for anyone feeling nervous about dating on the web. The global network gives you the opportunity to develop your online dating skills and find that special someone online, just like Stella did.